Palm Desert is a city that is located in Riverside County, California. United States. As a part of the Coachella Valley, the city lies approximately 14 miles East of Palm Springs, and 122 miles East of Los Angeles (about a 2 hour drive). As of the 2016 census, the population of the city stood at 52,231 which is a 70.5% increase in population from the 30,367 recorded in 1990. This city has consistently been one of the faster growing cities in the state of California. Snowbirds love it here and it is easy to see why! Palm Desert is a major center of growth in the Coachella Valley and is popular with seasonal residents like snowbirds as a retreat from cold winter climates. Predominantly traveling from the Eastern and Northern parts of the United States and Canada snowbirds swell the local population by approximately 31,000 people. This snowbird population along with significant winter tourism to the area cause seasonal fluctuations in the local economy. However, recent the summer seasons have seen a marked increase in economic activity. In the past few years, there have been more people from the coastal and urban centers of California who have relocated to the Desert and who have become “full-timers”. The reason for the influx of full-time residents is due to fact that the city offers both affordable and luxury properties, while costal prices have swelled significantly. This beautiful city is also home to some great art galleries museums and more! Famously boasting 350 days of sunshine, the climate in the Coachella Valley is influenced by the geography of the surrounding areas. There are high mountain ranges on three sides and a south-sloping valley all of these contribute to the unique and year-round warm climate of the Coachella Valley. The surrounding mountains block rainstorms from coastal areas and funnel in hot, dry air from the surrounding desert. The Coachella Valley boast the warmest winter in the Western United States with a very dry climate. The city’s low humidity, makes it an ideal climate to take in the sun and get a tan or take a tour on one of the many hiking trails in the area! The average high temperature is 89°F (32 °C) and the average annual low is 62 °F (17 °C). A Golf Mecca Was Born! The Shadow Mountain Golf Club (1952) was the city’s first golf course and tennis club. It was followed by Marrakesh (1954), the Palm Desert Greens mobile home park golf course (1961), and the Palm Desert Country Club (1962). 1992 marked a milestone in home construction when the ambitious Del Webb development of Sun City Palm Desert began take shape. This development alone accounted for 5,000 more homes once construction finished in 2002. The overwhelming total number of golf clubs in Palm Desert (there are over 30 and they are located within 10 miles from the city) has given it a reputation as a touchstone for golfers around the world. 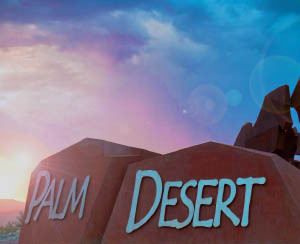 The city is home to some impressive attractions, including the College of the Desert, the McCallum Theatre, the Living Desert Zoo and Gardens, and the Palm Desert Civic Park (a favorite among dog owners). Residents of the city are treated to a wide array of events running all year round including the popular El Paseo Fashion Week. Palm Desert homes for sale have a median price of $310,000 as of 2016. These homes have increased in value significantly since the 2008 recession. There is a wide variety of homes available in the city for sale. Most homes are single level homes and basements in the area are a rare feature. If you are looking for the perfect community for a second or permanent home in the area, see the complete list of Golf Course and Non-Golf Course communities.